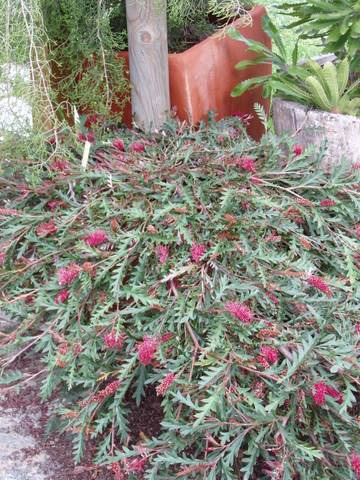 Beautiful prostrate grevillea with deeply lobed leaves with reddish new growth and burgundy toothbrush flowers in spring-summer. Prefers acidic soils but will grow well in slightly alkaline soils with the addition of sulphur applied at planting. Responds well to hard pruing. 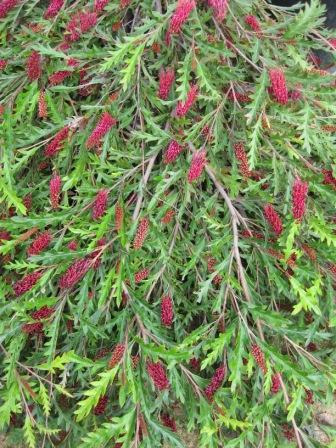 Its parents are believed to be G.x gaudichaudi and G. longifolia. Great for embankments or large containers.